Sasha Says Nails... I'm a Manicure Momma: NOTD: Sephora by OPI Let's Hear It For the Free Spirit! 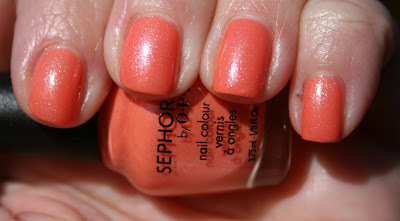 NOTD: Sephora by OPI Let's Hear It For the Free Spirit! Sephora by OPI Let's Hear It For the Free Spirit! Ok, I've totally solved The Mystery of the Sephora by OPI Minis. My set was definitely switched around (probably by a cute little 6 year old who resides in my house). And this shade is definitely Let's Hear It For the Free Spirit! The above swatch is two coats, and I was pleasantly surprised that it covered this well. And now I am officially ready for Spring! Isn't this pretty? I love how it glimmers.